Why is the mainstream media only in hysterics over ISIS and the “terrorist threats” from Muslims? Could it be that they are being manipulated, or even directed by our government agencies? And in the not too distance past, the government was admittedly involved in influencing the mainstream media. 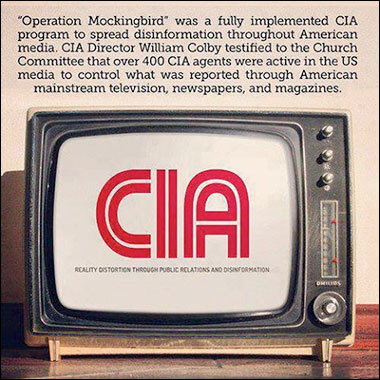 You may, or may not, have heard of Operation Mockingbird. 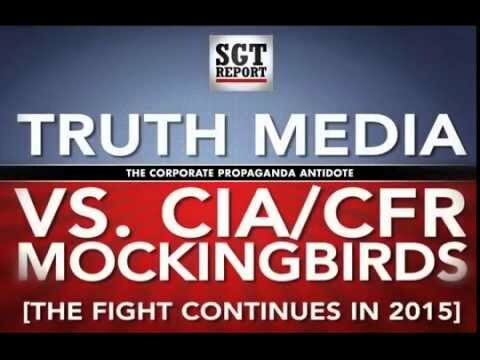 In case it has eluded you, Operation Mockingbird is a secret campaign by the United States Central Intelligence Agency (CIA) to influence media during the Fifties and Sixties. It was exposed and investigated by Congress in the Seventies. Some say it stills exists. The organization recruited leading American journalists into a network to help present the CIA’s views, and funded some student and cultural organizations, and magazines as fronts. It also worked to influence foreign media and political campaigns, in addition to activities by other operating units of the CIA. There are a dozens of sites with information on this. Below are just two. In 1977, journalist Carl Bernstein wrote a cover piece for Rolling Stones about the CIA and mainstream media. And here is wikipedia on Operation Mockingbird . A blue-ribbon panel of the Council on Foreign Relations suggested last year that the CIA be freed from some policy constraints on covert operations, like the use of journalists and clergy as cover. This is pretty scary. The folks at CFR are either running the world or they know who does. For 70 years they’ve rarely recommended anything that has not become policy. After doing some preliminary research here are some interesting facts to mull over. Since Sept. 11, 2001, nearly twice as many people have been killed by white supremacists, anti-government fanatics and other non-Muslim extremists than by radical Muslims. Another new study finds white supremacists and other non-Muslim fanatics have killed far more people in the United States since 9/11 than Muslim extremists. According to the research center New America, 26 people have been killed in jihadist violence in the U.S. since 9/11, but 48 people have been killed in attacks by right-wing groups. Despite the intense focus by the Obama administration on Muslim communities, non-Muslims have carried out 19 terrorist attacks since September 11,2001, while Muslims have been responsible for only seven. I keep wondering why all we hear about are Muslim attacks? Could it have anything to do with pushing an agenda for the endless war on terrorism here and abroad? Remember its’ corporations that benefit, not the dead and wounded fighting for “freedom”. War is business. Why start with sept 12 2001? The day before, 3000 Americans were slaughtered. That alters your preliminary research a bit huh? We keep hearing about Muslim attacks because there is a fairly large contingent in the Middle East who broadcasts beheadings, burnings, rapes, slavery etc on a daily basis. That’s real. Not imagined. I started after 9/11 because that’s when the “War on Terror” began. Obviously you didn’t read that part, or perhaps you have no interest in losing your 4th Amendment rights as long as the government promises to “keep you safe” from Muslim attacks, but attacks by crazed Americans should go unreported. Got it. I didn’t miss your point at all. I’m sure most readers didn’t either. I was just pointing out the large whole in your thesis; that you conveniently glossed over 9/11 to sell your argument. You should reread it. You see some imaginary hole that isn’t there. I didn’t gloss over 9/11 to sell the argument. The entire post is about what has gone on AFTER 9/11. In case you’ve been in a coma the War on Terror didn’t start until AFTER 9/11. That is what the post is about.